The Old-Line State was founded on principles of acceptance and tolerance more than 300 years ago. 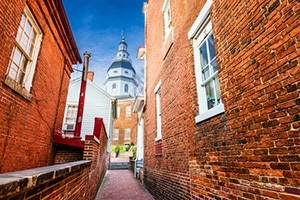 It is not surprising, therefore, that Maryland accommodates a foreign-born population of over 800,000 people. These hard-working newcomers add to a population that crowds around one of the greatest nautical inlets on the North American continent: the Chesapeake Bay. Fishing and the maritime industry are still very important, but healthcare and professional technical services are very large employers as well. The tech industry is very prominent with thousands of high-technology companies doing business in Maryland. For these people in particular ID theft is a very serious concern. They view it as a threat not just in day-to-day business but also in their private lives. A group legal plan that includes ID theft monitoring is something guaranteed to ease their anxieties. Immigrants to Maryland also have worries that require the help of an attorney. It is a strange land for them and the policies and procedures of public agencies can be bewildering. It can force them to not apply for deserved benefits, or seek needed public health. Any guiding hand from a legal professional is something that is deeply appreciated. Countrywide Pre-Paid Legal Services understands the worry of these hard-working people. Our group legal plan benefits provide options that can provide assistance in protecting online identity, as well as guiding plan members through the maze of agency bureaucracy. The group legal plan benefits that we developed for use take in consideration the need to contact highly qualified lawyers, skilled in areas of family law, estate planning, auto and real estate issues, as well as other legal subjects. We help employees have better control over their personal ID with credit monitoring options and the means to react immediately to any instance of possible identity theft. Human resources professionals want to improve existing benefit plans and provide more value. A Countrywide prepaid group legal plan can be instituted to help employees deal with domestic legal problems that could spill over in the workplace. It can be as important as representation in court, or as simple as an office consultation. It is whatever makes the burden lighter for a hardworking person. Implemented as a voluntary payroll deduction plan, the benefit provides a legal aspect which an employee can use for issues that do not involve employer/employee relations. Companies have taken advantage of our services, but they are not the only ones. Indeed, we also provide service to organizations, professional associations, unions, and other groups that have a number of employees needing legal protection as part of their benefits package. We work to make sure that any plan provides the best legal protection for employees. Countrywide tailors group legal plans so that they better fit the needs of an organization. That design work is always done with input from the client. Moreover, we work very closely with managers and human resource professionals to make sure that any prepaid group legal plan put into operation is something that is easy to administer. A lower average cost of living than other major Northeastern states is one of the reasons why the slogan Maryland of Opportunity is so popular from Baltimore to Cumberland. A company can truly show its appreciation for all of its dedicated employees by providing excellent benefits. A Countrywide group legal plan gives the security and legal support that brings great peace of mind to individual. A plan that is easy to administer, and has efficient service is something every human resources director dreams of having. By contacting us, we can better explain how Countrywide provides a legal benefit with great value to it.